My grandma always told us girls that “men are like buses…there’s always another one coming”. During whatever current heartbreak we were going through, her words weren’t terribly comforting. Looking back, though, I realize how much truth lay in them. My freshman year of college I was on the hunt for a man. I was lonely, my heart ached for love, and, frankly, I thought that meeting and marrying the man of my dreams was the highest goal of my life. It should come as no surprise to you that my search for a man fogged my vision and caused me to make more than a few mistakes in the boy department. The first was a guy that didn’t even like me as more than a “friend”. In my head, however, I’d decided that he was the guy for me. I made up this fantasy world in my head where he was exactly what I was “needing”, that we would soon admit our love for each other, and that that would be the end of the story. All I can say is I am so glad he didn’t show an interest in me. In reality, he was all wrong for me. If we’d ended up together we’d have made each other miserably unhappy. The fantasy in my head did not line up with reality, and dealing with reality would have been an unbearably hard pill to swallow. The second was a guy who really did like me. He was a really great guy with a heart for the Lord and I liked him too. Only, I never had peace about the whole thing. Something just wasn’t right. I decided to tell him, but then reconsidered when my hunger and aching for a man tried to sway me otherwise. In that situation, the only thing that stopped me was God. Out of the blue, I heard Him tell me two things: a very firm and resounding “NO”, and a very clear directive (and desire, strangely enough considering my former negativity) to join homeschoolalumni.org. At the time, I wanted to fight Him. There were no other guys in my life that I was even remotely interested in. I didn’t even know how I’d meet other guys. Furthermore, there was absolutely nothing wrong with this guy. When I say he was a great guy, I really mean it! What I realize now that I didn’t know then was that he was a great guy, but he wasn’t God’s best for me (nor was I God’s best for him). And so, with His leading ringing in my head I broke things off with this great guy, joined HSA, and clung to the words of my Grandmother. Little did I know that a month later I’d meet this other great guy named Andy Baker, or that I’d be engaged to him 9 months later. My friend, don’t lose heart, and don’t let your hunger for a man cloud your vision like it did mine. My grandmother was right…you never know what great guy is just around the bend. My kid is the cutest (or smartest or most beautiful)…you fill in the blank. Your kid is more advanced developmentally than mine? You’re probably exaggerating. My baby looks tiny next to yours? You must be feeding yours too much. My baby is really chunky? Yes sir, and I’m proud of it! I could totally blame my indigestion on the baby and no one would ever know. I’m trying to remember why I would have put the TV remote in the fridge. I wonder if the other mothers’ bellies look like squishy biscuit dough? Child, you are about to make me lose my mind. But somehow I still love you anyway. If the kids fall asleep in the car I’m totally stopping for a milkshake. 1. The Motivated Moms app on my phone. I’m a list maker. So, it should come to no surprise to you that I’ve tried just about every home management tool out there, from creating my own lists on Evernote to Flylady. The later just didn’t work for me. There were elements I loved, but some of the main components just didn’t make sense in my life. I don’t want to walk around the house with my shoes on, nor am I able to keep my sink clean constantly. Then a Facebook friend suggested Motivated Moms…and I fell in love. Even with being pregnant and working part-time, it worked for me. Then Baby Girl came along and I quit for awhile, but that past few months I’ve been back at it. I’ve customized it to work with my days and schedule, and I’m suddenly becoming way more productive…and my house is always in semi-decent shape. Even with a 9-month-old who started crawling last week and is into EVERYTHING. 2. Updating the budget every. single. morning. You already know how much I love YNAB. The only problem is, you have to manually enter things, which takes some time. Thankfully, however, I can update things quickly on my smartphone. When I’m feeding the baby, I’m usually looking at my phone anyway…so why not use it for something productive? Every morning I quickly pull up my various banking apps, as well as the YNAB app, and update and add things. Sometimes I still need to look for a receipt or log onto the computer to actually update budget categories, but that work is a breeze when I’ve already got almost everything entered in. It takes minutes, I stay on top of things, and I start every day knowing where our finances and budget stand. 3. Waiting to eat breakfast with Miles. My children are typically early risers, but a couple of times a week I actually get up before them…or at least one of them. ha! My favorite way to spend that time used to be spending quiet time with God and then eating breakfast alone. When my toddler got up, I’d feed him breakfast and try to get ready by myself. Only, my son is one of the slowest eaters ever. He gets every slower when nobody is sitting there eating with him. So, I would find myself still sitting at the kitchen table in my bathrobe at 10 am with nothing to do. Now, on those rare days, I do my quiet time and then take a shower or get ready. On the really rare days that I still have extra time, I log onto the computer or do any number of tasks that are hard to do with my son around (read: trying to help and just making things harder!). Whenever he gets up, I make breakfast for the both of us and we eat together. My son eats faster, I’ve accomplished a lot more, and less time is wasted. Problem solved! What are some of your favorite productivity helpers? 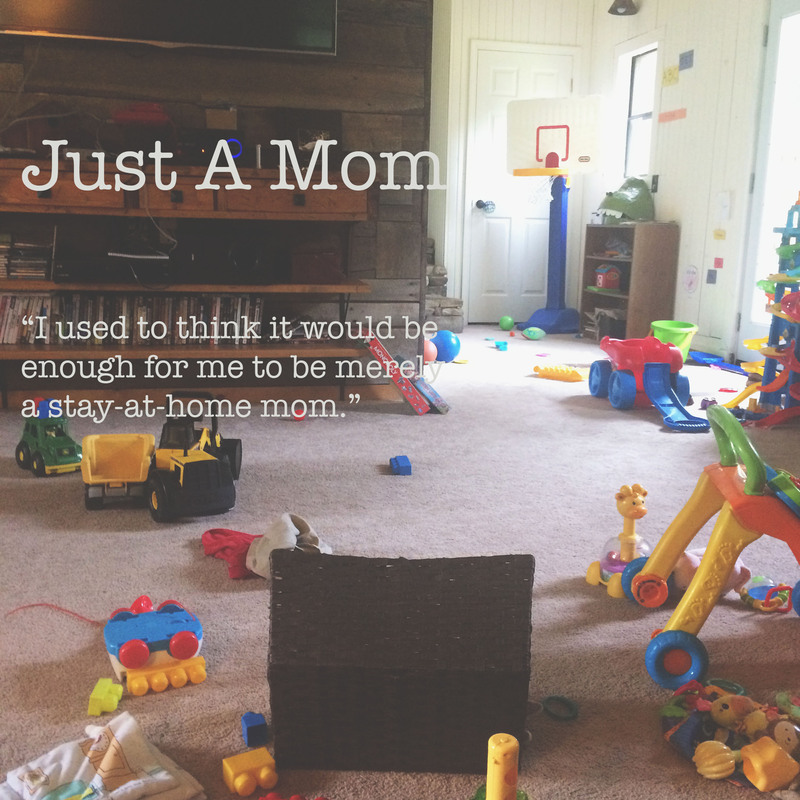 I used to think it would be enough for me to be merely a stay-at-home mom. I had grown up watching my intelligent, PhD holding mother spend her days folding laundry, cooking food, and bandaging scraped up knees. For her, gone were the days of helping troubled families in the court system and bringing in decent money from her highly-esteemed career. But she never seemed to mind. In fact, she thrived and found the most purpose in those quiet days full of simple tasks. I knew unwaveringly that I wanted to be just a mom…just like her. The years passed and I became just that. Yet, I was surrounded by friends and women who were more than just moms. Women I respected. Women I enjoyed being around. Suddenly my confidence and surety wavered. I began to feel less able and less important than these other women. I felt like I could never join in and complain about having a messy house or not having enough hours to get everything done because, after all, they did what I did plus some. They went to work all day and then had to deal with the laundry and cooking and housework. Some even worked on schoolwork after their children went to bed. I used to think I was smart, hard working, and highly educated, but amongst these busy, capable women I started to doubt myself. There were women who talked about how they could never just sit home all day…how they had to be doing something. And so I questioned myself. Am I really that much of a homebody? Do I really do so little? Am I bored? Couldn’t I juggle all of those things too? That Still Small Voice began speaking to my heart. I could do all those things…juggle all those things. I am an intelligent, educated, hard-working woman. I am just as capable, but in this season of life, I choose something different. I choose to not juggle all those things and do all those things. 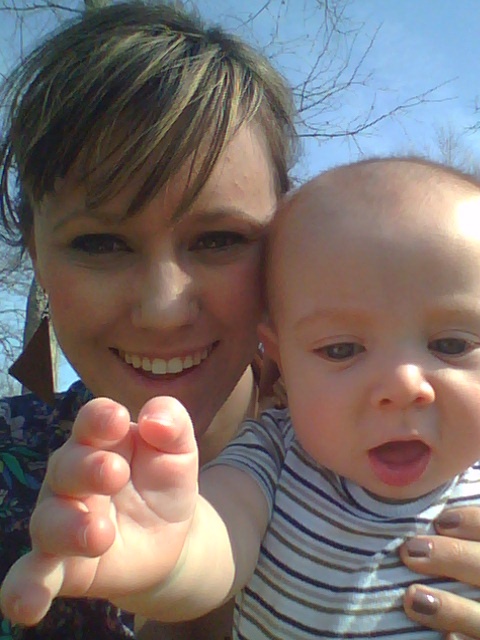 Right now, I choose to be just a mommy and just a homemaker. Mamas who are just mamas: don’t doubt yourselves. Don’t question your worth or value or abilities. Remember that, like me, you chose this path. You chose to find your purpose and fulfillment in this season not in being able to do it all or be all things to all people, but instead in the small little tasks that come along with being “just a mom”. I know that one day when our kids are all grown up and gone, we will be glad that we sacrificed so much for those extra minutes with our babes. We will be thankful that we got the chance to be just moms…and that we took it. She’s up in the nursery blissfully rocking.